294 Beacon is located on the north side of Beacon, between Exeter and Fairfield, with 292 Beacon to the east and 296 Beacon to the west. 294 Beacon was built ca. 1870, one of two houses (292-294 Beacon) which form a symmetrical pair, with 294 Beacon being four feet wider. 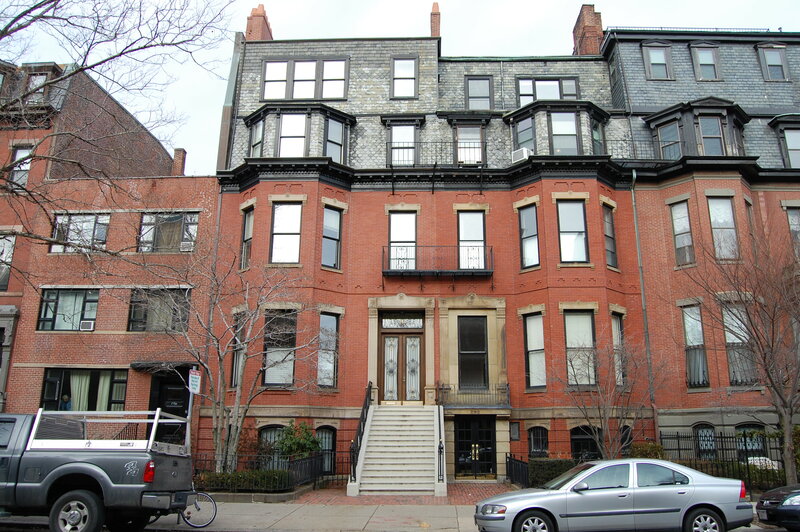 294 Beacon was built for Stephen Minot Weld, Jr. and his wife, Eloise (Rodman) Weld. They had married in June of 1869. At the time of the 1870 US Census, they were living in Dedham with her mother, Anna Lothrop (Motley) Rodman, the widow of Alfred Rodman. 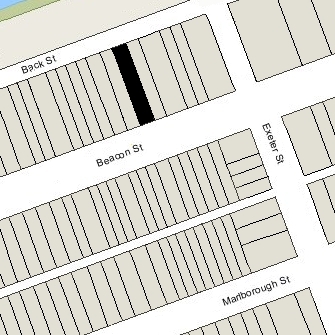 Stephen Weld purchased the land for 294 Beacon on May 27, 1870 from the Boston and Roxbury Mill Corporation. It appears that the house was erected before he took title to the land, inasmuch as, one day later, he transferred both the land and house to himself and his mother-in-law as trustees for the benefit of his wife under a marriage settlement agreement. Click here for an index to the deeds for 294 Beacon. Stephen Minot Weld, Jr., served in the Civil War from 1861 to 1865. He rose to the rank of Colonel and, upon discharge, was brevetted a brigadier general. After the war, he became a cotton and wool broker, and served as treasurer of the Elliott Felting Mills. The Welds continued to live at 294 Beacon in 1876, but had moved to Dedham by 1877. On January 10, 1876, 294 Beacon was acquired from Stephen Weld by investment banker Francis Lee Higginson. He married in February of 1876, to Julia Borland, and on March 23, 1876, he transferred the property to himself and his father as trustees for the benefit of his wife. Before their marriage, he had lived at 210 Beacon. Francis and Julia Higginson continued to live at 294 Beacon during the 1882-1883 winter season, after which moved to their newly-built home at 274 Beacon. On June 1, 1883, 294 Beacon was purchased from Julia Higginson’s trustees by Elizabeth Gardiner (Stone) Bacon, the wife of William Benjamin Bacon, Jr. In April of 1883, he had retired as manager of the New England Electric Light Company. They continued to live at 294 Beacon during the 1884-1885 winter season, but moved thereafter to Lenox. During the 1885-1886 winter season, 294 Beacon was the home of Henry Sturgis Russell and his wife, Mary Hathaway (Forbes) Russell. Their primary residence was Home Farm in Milton. He was president of the Continental Telephone Company. On June 26, 1886, 294 Beacon was acquired from Elizabeth Bacon by George Hignett Warren. He and his wife, Josephine Mary (Neilson) Warren, made it their home. They previously had lived at 201 Beacon (285 Clarendon). George Warren was a ship owner and shipping merchant in his father’s firm, George Warren & Co., operators of steamships between Liverpool and Boston. His principal residence was Strawberry Field in Woolton, Lancashire, near Liverpool (the house later became a Salvation Army home for children, and was made famous by the Beatles in their song, “Strawberry Fields Forever”). George and Josephine Warren lived at 294 Beacon during the 1886-1887 and 1887-1888 winter seasons, and then returned to England. On June 26, 1888, 294 Beacon was acquired from George Warren by his brother, Frederic Warren. He and his wife, Margaret (Langton) Warren, made it their home. They previously had lived at 40 Commonwealth. They also maintained a home in Beverly Farms. Frederic Warren was a partner in George Warren & Co.
Frederic Warren died in September of 1901, the victim of a carriage accident. Margaret Warren moved thereafter to England. 294 Beacon was not listed in the 1902 Blue Book. On August 22, 1902, 294 Beacon was purchased from Frederic Warren’s estate by the Proprietors of the Arlington Street Church, and on December 9, 1902, it was acquired from the Proprietors by Rev. Paul Revere Frothingham, minister of the church, and his wife, Anna (Clapp) Frothingham. They previously had lived at the Hotel Victoria at 273 Dartmouth and before that at 163 Commonwealth. During the 1910-1911 winter season, it appears they may have been living elsewhere: he is listed in the Blue Book at 294 Beacon under the entry for the Arlington Street Church, but under 294 Beacon, Mr. and Mrs. W. Churchill are shown as the only residents. This probably was the author Winston Churchill and his wife, Mabel Harlakenden (Hall) Churchill. In November of 1917, Rev. Frothingham applied for (and subsequently received) permission to remodel the stables at the rear of the property into a garage. From the early 1920s, the Frothinghams were listed in the Blue Books at 294 Beacon with the indication that they were living at Hotel Touraine (southeast corner of Boylston and Tremont). In 1921, 294 Beacon was the home of Marian (Linzee) Weld, the widow of dry goods merchant and banker Christopher Minot Weld. She also maintained a home in Milton. In 1920, she had lived at 18 Marlborough. By 1922, she had moved to 4 Marlborough. By the 1921-1922 winter season, 294 Beacon was the home of Ward Thoron and his wife, Louisa Chapin (Hooper) Thoron. They previously had lived at 46 Mt. Vernon in 1921 and before that at 393 Marlborough. They also maintained a home in Danvers. Ward Thoron was treasurer of the Merrimack Manufacturing Company, operators of textile mills, and formerly had been a lawyer in Washington DC. The Thorons continued to live at 294 Beacon until 1924. From about 1925 to 1928, they lived in Danvers throughout the year, but by the 1928-1929 winter season, they made 253 Marlborough their Boston residence. During the 1924-1925 winter season, 294 Beacon was the home of Russell Robb and his wife, Edith Owen (Morse) Robb. Their primary residence was in Concord. He was senior vice president and treasurer of Stone & Webster, the international engineering firm. By the 1925-1926 season, they had moved to 101 Chestnut, where he was living at the time of his death in February of 1927. During the 1925-1926 winter season, 294 Beacon was the home of contractor William Samuel Patten and his wife, Anna Morton (Thayer) Patten. They previously had lived at 234 Beacon. They moved by the 1926-1927 winter season and were living at 388 Beacon by the 1927-1928 season. Paul and Anna Frothingham had continued to live at The Touraine during the winter seasons. He died in November of 1926, and she moved to the Hotel Vendôme. By the 1926-1927 winter season, 294 Beacon was the home of investment banker Malcolm Whelen Greenough and his wife, Kathleen Lawrence (Rotch) Greenough. They previously had lived at 20 Fairfield. 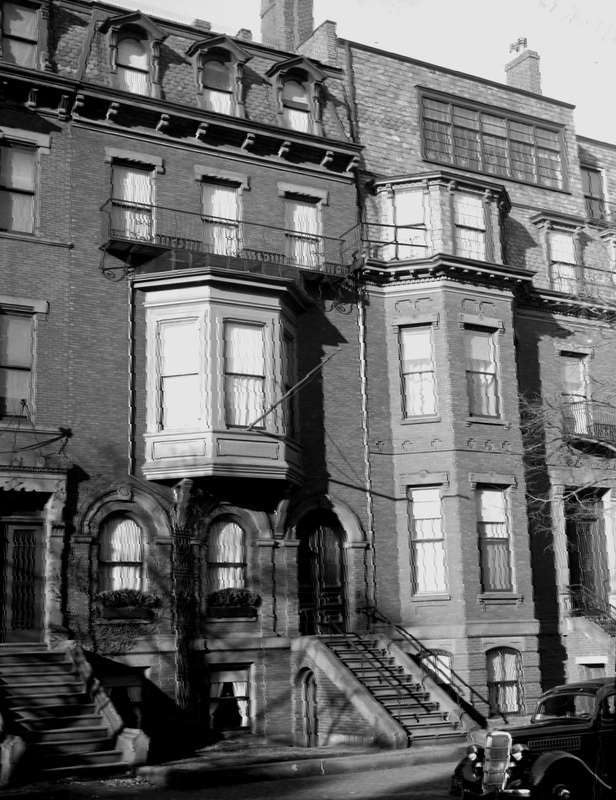 The Greenoughs continued to live at 294 Beacon during the 1927-1928 season, but moved soon thereafter to 416 Beacon. By the 1928-1929 winter season, 294 Beacon was the home of Francis Douglas Cochrane and his wife Ramelle McKay (Frost) Cochrane. F. Douglas Cochrane was a banker and a founder of the New England Oil Refining Company. They had lived at 204 Commonwealth during the previous season. 294 Beacon and 204 Commonwealth were temporary residences; they owned 257 Commonwealth, where they had lived in 1927 and once again lived in 1931. On July 1, 1930, 294 Beacon was acquired from Paul Frothingham’s estate by Edward Jackson Holmes, Jr., an attorney, who owned and lived at 296 Beacon with his wife, Mary Stacy (Beaman) Holmes. In April of 1930, prior to taking title to the property, he filed for (and subsequently received) permission to combine the two houses into one property, as a two-family dwelling with one family in each of the formerly separate houses. At the same time, he also obtained approval to raise the roof of 294 Beacon. The remodeling was designed by architects Kilham, Hopkins, and Greeley. Plans for the remodeling — including elevations, floor plans, and framing plans — are included in the City of Boston Blueprints Collection in the Boston Public Library’s Arts Department (reference BIN B-9). Edward and Mary Holmes continued to live at 296 Beacon and appear to have leased 294 Beacon to others. By the 1931-1932 winter season, 294 Beacon was the home of Anna Louise (Bull) Benedict, the widow of wholesale wool merchant George Wheeler Benedict. She previously had lived in Cambridge. In 1933, she authored a spiritualism book, The Continuity of Life. She continued to live at 294 Beacon during the 1935-1936 season, after which she moved to The Tudor (northwest corner of Beacon and Joy). By 1937, 294 Beacon was the home of Dr. Franc Douglas Ingraham and his wife, Martha (Wheatland) Ingraham. They previously had lived in Newton. Franc Ingraham was a physician and neurosurgeon. He pioneered the field of pediatric neurosurgery. The Ingrahams continued to live there until about 1941, when they moved to Chestnut Hill. In August of 1941, Edward Holmes filed for (and subsequently received) permission to separate 294 and 296 Beacon into two houses, with each remaining a single-family dwelling. The decision to separate the houses appears to have coincided with the Holmes’ decision to move from 296 Beacon, which was shown as vacant in the 1942-1946 City Directories. By 1942, 294 Beacon was the home of Helen (Brooks) Emmons, the widow of banker and broker Robert Wales Emmons. She previously had lived in an apartment at 276 Marlborough. In June of 1945, Edward Holmes (then living in Topsfield) filed for (and subsequently received) permission to remodel the interior of 294 Beacon, providing for the basement, first, and second floors to be occupied, and the upper two floors to remain vacant, with access by a ladder. 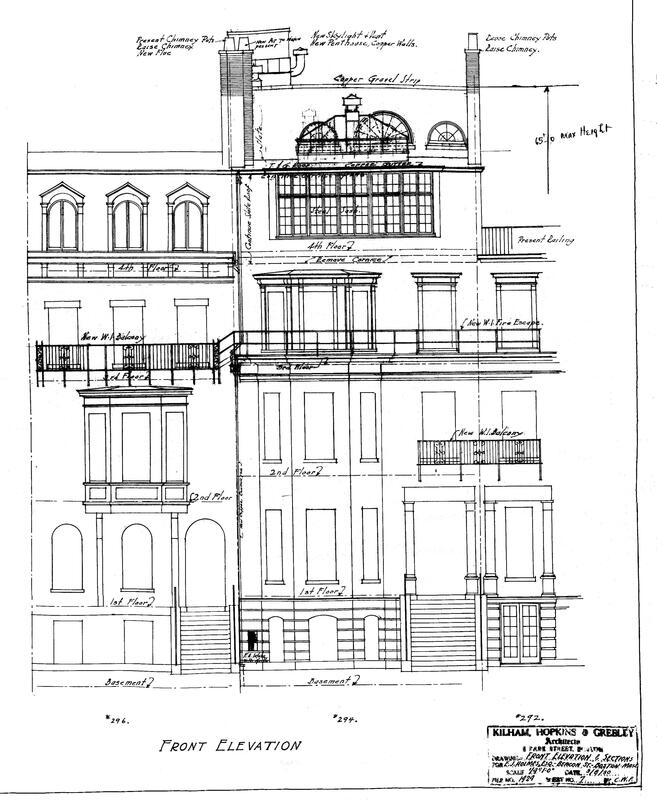 Plans for the remodeling, designed by architect H. Daland Chandler, are included in the City of Boston Blueprints Collection in the Boston Public Library’s Arts Department (reference BIN R-56). On April 11, 1946, Helen Emmons acquired 294 Beacon from Edward Holmes. She continued to live there until about 1957. On June 24, 1957, 294 Beacon was purchased from Helen Emmons by Thomas Spiro, who also owned 296 Beacon., where he had demolished the original townhouse and built a new apartment house. On August 1, 1957, Thomas Spiro transferred the property to the Thomas & Eliot Investment Corporation, of which he was the president. In December of 1957, the Thomas & Eliot Realty Corporation filed for (and subsequently received) permission to convert 294 Beacon from a single-family dwelling into nine apartments. At the same time, it also received permission to demolish the garage at the rear of the property. On January 2, 1976, 294 Beacon was acquired from Thomas and Eliot Investment Corporation by David E. Hoppe. On May 8, 1989, 294 Beacon was purchased from David Hoppe by Richard Nason Morash and his wife, Elizabeth Gradbury (Tweedy) Morash. In August of 1989, they applied for (and subsequently received) permission to reduce the number of units from nine to three, and also to construct a new garage at the rear. In July of 1990, they applied for (and subsequently received) permission to further reduce the number of units to two. On January 14, 1991, 294 Beacon was purchased from Richard and Elizabeth Morash by Patricia A. Casale. 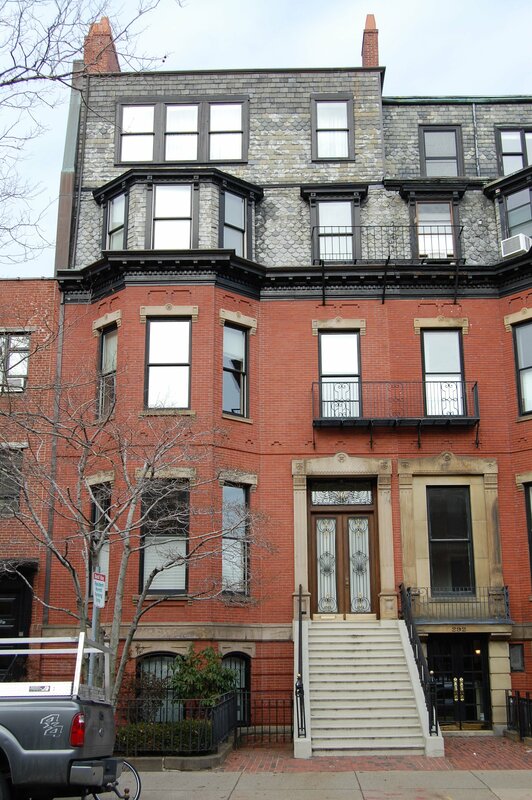 On June 3, 1993, she converted the property into two condominium units, the 294 Beacon Street Condominium.